The kundalini power lies at rest at the lower end of the spine like a IIcoiled snakell and enters the system through the Root Chakra. The kundalini power flows through the sushumna in a mere trickle in most people. But when it is awakened, it rises up the sushumna like a growing stream, activating the chakras, supplying them with vibrations, causing them to expand and increase their vibrationalfrequency. This ancient practice designed to awaken Kundalini Shakti the healing and transforming energy. This meditation helps set your mind and body free, become more spontaneous and creative. It is a trance technique allowing to work delicately with your Kundalini energy and reach the state of blossoming. On the third stage of the meditation you can direct the awakened Kundalini toward your goal. Then this practice becomes truly mystical. If you want to practice Kundalini awakening for achieving one of your goals then you have to set one clear goal before beginning the meditation. *For this process you must obey your spiritual instruction. 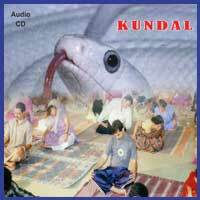 The word Kundalini is derived from a Sanskrit word 'Kundal' meaning coiled up. It is the primordial dormant energy present in three-and-a-half, coils at the base of the spine in a triangular bone called the Sacrum. 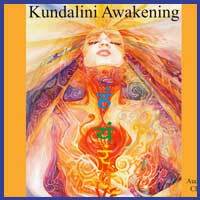 Awakening kundalini is best thought of as awakening your true potential as a spiritual human being. People who practice Kundalini Yoga believe the majority of our psychic and emotional energy is trapped in our base chakra, located at the base of the spine, and that the practice of yoga can release this energy, sometimes referred to as kundalini shakti. Once released, the energy travels upward through the chakra system as each of the seven energy centers opens and releases. Thus, the purpose of Kundalini Yoga is to awaken the kundalini and tap into the energy from the lower chakras, releasing it so it may move upward in the body. Kundalini Yoga practitioners also believe the kundalini rising will stimulate the pineal gland, which some think is the key to enlightenment. Based on the belief that its practice allows you to cope better with the daily stresses of life by helping you to tap into a higher consciousness, Kundalini Yoga emphasizes the release of spiritual energy within the body. Kundalini Vibration is set of Yogic practices that use a holistic and balanced approach to create and sustain physical, mental, emotional and spiritual health and well-being. Kundalini Yoga incorporates asanas, chanting, meditation, and pranayama techniques to awaken and nourish the Kundalinii energy that lies dormant at the base of the spine. According to ancient Vedic wisdom, the Kundalini energy is coiled three and a half times at the base of the spine of every human being. When the Kundalini energy is awakened, great joy, wisdom, peace, creativity, and energy are released. The Kundalini energy is healing and transformative by its very nature and can lead us to oneness with the divine essence of all reality. The ultimate goal of Kundalini Vibration is to awaken the Kundalini energy and to nourish the energy as it rises through and penetrates the seven chakras, culminating in the seventh chakra, the Crown, at the top of the skull. When the Kundalini Vibration pierces the Crown Chakra great bliss arises, as well as a profound knowledge of the Divine. There are also many other benefits to the practice of Kundalini Vibration. One of the most important physical benefits you receive from a regular practice of Kundalini Vibration is an optimally-balanced endocrine system. As your hormones balance, a sense of well-being quickly ensues. A regular practice of Kundalini Vibration will ease aches and pains, improve your energy level, and reduce stress. As your sadhana or spiritual practice continues to deepen, you will experience a profound sense of well-being, joy, lightness and love at the core of your own being. *For this process you must obey your spiritual instruction.